BY DUANE A. VACHON, PH.D. Humbert Roque Versace has two connections to Hawaii: he was born in Honolulu, Hawaii on July 2, 1937, and his name is engraved on one of the walls in the Courts of the Missing in the Honolulu Memorial at the National Memorial Cemetery Of The Pacific, Honolulu, Hawaii. In a sense, Hawaii was the Alpha and Omega of Versace’s life. Army Captain Humbert Roque ‘Rocky’ Versace wanted to become a priest and work with Vietnamese orphans. He’d been accepted into a seminary, but his dream was not to be fulfilled. Two weeks before he was due to return home, Versace, 27, was captured on October 29, 1963, by Viet Cong guerrillas who spent the next two years torturing and trying to brainwash him. In return, he mounted four escape attempts, ridiculed his interrogators, swore at them in three languages and confounded them as best he could, according to two U.S. soldiers captured with him. The witnesses said the unbroken Versace sang “God Bless America” at the top of his lungs the night before he was executed on September 26, 1965. His remains have never been recovered. Versace was the oldest of five children born to Humbert J. Versace and Marie Teresa Rios, a well-known author. Her book “The Fifteenth Pelican” was the book on which the TV series “The Flying Nun” was based. Versace grew up in Alexandria, Virginia, where he graduated from Norfolk Catholic High School. He joined the Army in Norfolk, Virginia and, following in his father’s footsteps, he entered the United States Military Academy West Point. Graduating in 1959, he was commissioned a Second Lieutenant of Armor in the U.S. Army. Versace applied for and was accepted for training as a Ranger. 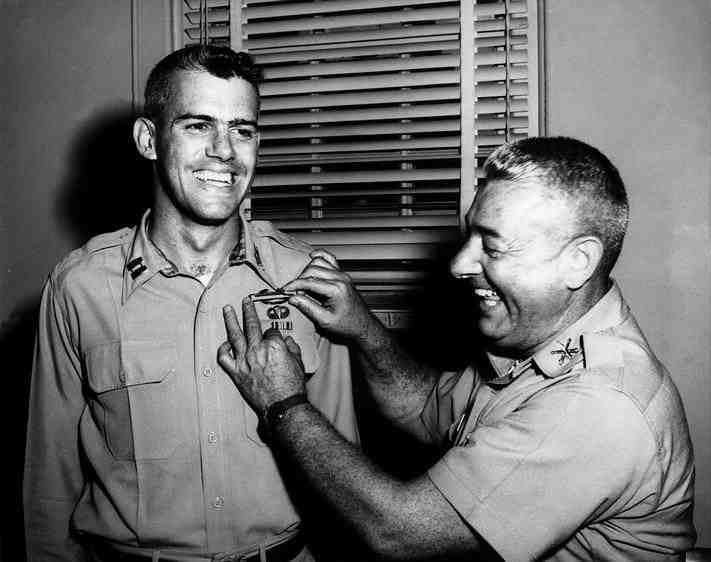 He was a member of Ranger Class 4-60 and was awarded the Ranger Tab on December 18, 1959. Upon graduation from Ranger School, Versace who had been promoted to Captain attended Airborne School and was awarded the parachutist badge. He then served with 3rd Battalion, 40th Armor, 1st Cavalry Division in the Republic of Korea as an M-48 tank platoon leader from March 1960 to April 1961. Captain Versace was then assigned to the 3d U.S. Infantry (Old Guard), where he served as a tank platoon leader in Headquarters Company. After volunteering for duty in Vietnam, he attended the Military Assistance Institute, the Intelligence course at Fort Holabird, Maryland, and the USACS Vietnamese language Course at the Presidio of San Francisco. Versace’s first tour of duty began in May 1962. As his tour as an intelligence advisor drew to an end in May of 1963, Versace volunteered for a six month extension of duty. He was planning to attend a seminary to become a Catholic Priest and the six month extension would work well into his entry into the seminary. With only two weeks to go in his extended tour, serving with Detachment A-23, 5th Special Forces Group in the Mekong Delta as an intelligence advisor, Versace accompanied several companies of South Vietnamese Civilian Irregular Defense (CIDG) troops who had planned to remove a Viet Cong (VC) command post located in the U Minh Forest, a Viet Cong stronghold. A VC Main Force battalion ambushed and overran Versace’s unit, wounding him in the process. He was able to provide enough covering fire so that the CIDG forces could withdraw from the killing zone. A second government force of about 200 men operating only a few thousand yards from the main fight learned of the disaster too late to help. U.S. authorities said the communist radio jammers had knocked out both the main channel and the alternate channel on all local military radios. Versace was captured and taken to a prison deep in the jungle along with two other Americans, Lieutenant Nick Rowe and Sergeant Dan Pitzer. He tried to escape four times, but failed in his attempts. Versace insulted the Viet Cong during the indoctrination sessions and cited the Geneva Convention treaty time after time. The Viet Cong separated Versace from the other prisoners. The last time the prisoners heard his voice, he was loudly singing “God Bless America“. On September 26, 1965, North Vietnam’s “Liberation Radio” announced the execution of Captain Humbert Roque Versace. Versace’s remains have never been recovered. His headstone at Arlington National Cemetery stands above an empty grave and can be located in the Memorial section MG-108. On July 8, 2002, in a ceremony in the White House East Room, Versace was posthumously awarded the Medal of Honor by President George W. Bush for his heroism, the first time an Army POW had been awarded the nation’s highest honor for actions in captivity. Present were his surviving siblings, Dr. Stephen Versace, Richard (former coach of the Indiana Pacers), Michael and Trilby Versace. On November 7, 2008, the Department of the Army announced that the Silver Star awarded to Versace was revoked. For conspicuous gallantry and intrepidity at the risk of his life above and beyond the call of duty while a prisoner of war during the period of October 29, 1963 to September 26, 1965 in the Republic of Vietnam. While accompanying a Civilian Irregular Defense Group patrol engaged in combat operations in Thoi Binh District, An Xuyen Province, Republic of Vietnam on October 29, 1963, Captain Versace and the CIDG assault force were caught in an ambush from intense mortar, automatic weapons, and small arms fire from elements of a reinforced enemy Main Force battalion. As the battle raged, Captain Versace fought valiantly and encouraged his CIDG patrol to return fire against overwhelming enemy forces. He provided covering fire from an exposed position to enable friendly forces to withdraw from the killing zone when it was apparent that their position would be overrun, and was severely wounded in the knee and back from automatic weapons fire and shrapnel. He stubbornly resisted capture with the last full measure of his strength and ammunition. Taken prisoner by the Viet Cong, he demonstrated exceptional leadership and resolute adherence to the tenets of the Code of Conduct from the time he entered into a prisoner of war status. Captain Versace assumed command of his fellow American prisoners, and despite being kept locked in irons in an isolation box, raised their morale by singing messages to popular songs of the day, and leaving inspiring messages at the latrine. Within three weeks of captivity, and despite the severity of his untreated wounds, he attempted the first of four escape attempts by dragging himself on his hands and knees out of the camp through dense swamp and forbidding vegetation to freedom. Crawling at a very slow pace due to his weakened condition, the guards quickly discovered him outside the camp and recaptured him. Captain Versace scorned the enemy’s exhaustive interrogation and indoctrination efforts, and inspired his fellow prisoners to resist to the best of their ability. When he used his Vietnamese language skills to protest improper treatment of the American prisoners by the guards, he was put into leg irons and gagged to keep his protestations out of earshot of the other American prisoners in the camp. The last time that any of his fellow prisoners heard from him, Captain Versace was singing God Bless America at the top of his voice from his isolation box. Unable to break his indomitable will, his faith in God, and his trust in the United States of America and his fellow prisoners, Captain Versace was executed by the Viet Cong on September 26, 1965. Captain Versaces extraordinary heroism, self-sacrifice, and personal bravery involving conspicuous risk of life above and beyond the call of duty were in keeping with the highest traditions of the United States Army, and reflect great credit to himself and the U.S. Armed Forces. There were three Americans captured during the eight-hour firefight that was to end with their being taken prisoner. Versace and the other two Americans suffered in a Viet Cong prison camp for almost two years. Versace was the proverbial pain in the back side to his captors, adamantly refusing to accept their vicious and inhumane attempts at propagandizing and repeatedly trying to escape. On September 26, 1965, North Vietnam’s “Liberation Radio” announced the execution of Rocky Versace and another American POW ostensibly in retaliation for the deaths of 3 terrorists in Da Nang. Versace’s remains have never been recovered. His stone at Arlington National Cemetery stands above an empty grave. The last memory of the remarkable Versace was that of his fellow captives who described the stalwart officer loudly singing “God Bless America,” from his tiger cage the night before his execution. One of the great ironies of Rocky’s death was that he was just weeks away from leaving the Army and studying for the priesthood. His goal: Returning to Vietnam as a Maryknoll missionary to work with orphaned children. he volunteered twice.he knew the risk. don't mess with the viet-cong.